I use the Contact Form 7 plugin for my site's contact form. The plugin's developer, Takayuki Miyoshi, created a complimentary plugin, Really Simple CAPTCHA, that incorporates with Contact Form 7 to provide a CAPTCHA for forms. In a nice example of forward thinking, Miyoshi created Really Simple CAPTCHA as a stand-alone plugin, complete with API, to facilitate other plugins' incorporation of CAPTCHA functionality. I had been using the excellent Math Comment Spam Protection plugin for my comments form. However, continued development of the plugin has been dormant (the last update was almost three years ago), and the developer hasn't kept it updated with newer WordPress releases (I had to hack it to ensure compatibility with WordPress 3.0). Not wanting to take on maintaining a fork of Math Comment Spam Protection, realizing that I was actually using two different CAPTCHA solutions on my site, and wanting to take on the challenge of figuring out how to use Really Simple CAPTCHA's API, I decided to try to implement it for my comment form, directly into my Theme via functions.php. Creating the CAPTCHA image, and adding associated fields to the comment form. Validating the CAPTCHA response when the comment form is submitted. // Characters to use in CAPTCHA image. // Number of characters in CAPTCHA image. // Width/Height dimensions of CAPTCHA image. // Font color of CAPTCHA characters, in RGB (0 - 255). // Background color of CAPTCHA image, in RGB (0 - 255). // Font Size of CAPTCHA characters. // Width between CAPTCHA characters. <img src="<?php echo $comment_captcha_image_src; ?>"
// ReallySimpleCaptcha class option defaults. // Changing these values will hav no impact. For now, these are here merely for reference. // TODO: Add admin page to allow configuration of options. At this point, your comment form should have a (non-functional) CAPTCHA field and image. Now we need to validate the CAPTCHA when the form is submitted. Once again, our first step is to instantiate the ReallySimpleCaptcha() class. // If CAPTCHA validation fails (incorrect value entered in CAPTCHA field) don't process the comment. That's it! Now you should have a fully functional CAPTCHA for your comment form. To use the same technique, just drop the above two functions and corresponding hooks into your Theme's functions.php file, then install and activate the Really Simple CAPTCHA plugin. In case you would rather not mess with your Theme's functions.php file, I have also created a plugin to accomplish the same thing: cbnet Really Simple CAPTCHA Comments. I've added inline documentation, and cleaned up the code a bit. 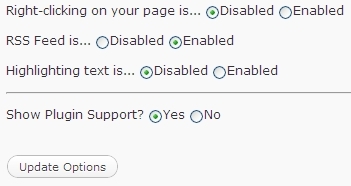 In a subsequent version, I will include an admin options page for setting the configurable options. For now, options can be set in the PHP file. ( ! $user_ID ) - if $user_ID is set, then the user is logged in, so we don't need to add a CAPTCHA. ( class_exists('ReallySimpleCaptcha') )- the ReallySimpleCaptcha() class corresponds to the Really Simple CAPTCHA plugin, upon which our code depends. If it's not installed/activated, we don't want to try to use it. Licensed under a CC By-NC-ND 3.0 United States license.All WordPress code is licensed under GPL, Version 2 (or later). Within the WordPress community, the question of GPL inheritance of WordPress themes erupts into contentious debate with the reliability - if not the frequency - of Old Faithful. While I understand that, according to the GPL interpretation of Matt Mullenweg, the Free Software Foundation (FSF), and the Software Freedom Law Center (SFLC), WordPress themes are derivative of WordPress and therefore must necessarily inherit WordPress' GPL, I would like to investigate the issue not in light of their interpretation but rather in light of copyright law and precedent case law. Before I begin, let me add an important caveat: I have no qualms with the GPL. I have always released - and will continue to release - under GPL anything I develop related to WordPress. I do so because I choose to do so, as a means of making even a minor contribution to a project from which I believe I have personally benefited. I do have issues with how the GPL-inheritance question has been handled - but those issues are out-of-scope for this post. Having (hopefully) made that point clear, let's begin! Note the key adjectives: recast, transformed, and adapted. This clause establishes the boundary around copyright between copyrightable expression, and non-copyrightable ideas. The GPL only applies to distribution of a (modified or unmodified) GPL-licensed work, or a derivative work. Any activity involving use, modification, or creation of derivative works that does not involve distribution is outside of the scope of the GPL. Distribution of a (modified or unmodified) GPL-licensed work, or a derivative work, requires that such distribution be licensed under GPL. The GPL is what is now referred to as a "copyleft" license: a modified public-domain license that takes advantage of the exclusive rights granted by copyright law to prevent derivative works from being restrictively licensed. Since the copyright owner has exclusive right to produce and to distribute derivative works based on the copyrighted work, the GPL intends to grant unlimited usage rights (to use, study, modify, etc.) to the end-user, while forcing follow-on developers of derivative works to release those works under the same license. It is important to understand that, because the GPL explicitly defines any activity not involving distribution to be out of the scope of the license, and since right of distribution is solely derived from copyright law, that GPL derives its legal basis from copyright law alone. This distinction separates the GPL from most other traditional software licenses, which derive their basis for usage and modification restrictions not from copyright law, but from contract law. WordPress is released under GPL version 2.0. I'll try to summarize below the parts of the license germane to derivative works. Personally, I think the plugin's functionality is ineffective toward its purported objective; but that's not the biggest complaint I have with this plugin. Despite being ineffective, the plugin is an SEO/spam Trojan horse. First up: spam injected in the plugin's options admin page. And it's a huge banner, too: it takes up 100% of screen width, and 20% of screen height. In other words, on my screen, it takes up about three times the space taken up by the actual options presented on the page. And that this advertising spam is injected using an iframe, rather than an image bundled with the plugin, presents a huge, potential vector for security threats. For one, the plugin author has complete control over the contents of the URL linked by the iframe. I subscribe to the TNO - Trust No One - security model. Besides, even if the plugin developer has only benevolent intent with this iframe, his site could get hacked, giving the hacker potential access to every site on which the plugin is installed. Moving on to the even-more-spammy links injected into wp_footer. The plugin must not embed external links on the public site (like a "powered by" link) without explicitly asking the user's permission. #4. Insert SEO spam links into people’s blogs (like <a href=”http://example.com/”>video poker</a>). #5. Insert external links (like a credit link, <a href=”http://example.com/”>My Awesome Plugin by Awesome Sauce</a>) into their blog without explicitly asking their permission, or make the default option be to insert the link. #6. Load portions of the code from an external site for no valid reason, or use any other trick to work around #3, #4 and #5. And here's the kicker: after putting up with all of that, what do you get? A totally ineffective plugin! First, when testing out the plugin, I noted that, while the right-click disable appeared to be working, the text-highlight disable wasn't. I was able to select text both using the mouse to select specific text, and using CTRL-A to select all text. But even more problematic are the plugin's faulty assumptions. The plugin assumes that anyone right-clicking or highlighting text on your site is attempting to steal your content, and that anyone using your RSS feed is attempting to scrape your content. In fact, the majority of people right-clicking and highlighting text on your site are doing so in order to link to/comment on your content, and the majority of users of your RSS are doing so for its intended purpose (to read your content). Use of this plugin will result in the loss of all of your RSS subscribers, and a sharp reduction in people extending the conversation by writing about/commenting on your blog posts. The plugin has absolutely no way to disable website visitors from using the view-source functionality built into every web browser. Even with the plugin enabled, one needs merely to invoke the browser's view-source functionality (in Firefox or Chrome, type "CTRL-U"; in Internet Explorer, select "View" from the menu, then "View Source"), which presents the entire contents in text format. For all the reasons above, I would recommend against using the JR Protection plugin. Further, unless the plugin is modified to address the plugin repository restriction violations listed above, the plugin should be removed from the wordpress.org plugin repository. Otto has an even better suggestion: use is_user_logged_in(). I have updated the recommended fix accordingly. Thanks, Otto! As many people have noticed, the Math Comment Spam Protection plugin no longer works in WordPress 3.0. Unfortunately, the plugin appears to be no longer supported by its author, so some people are searching for an alternative plugin. However, I have some good news: after a bit of trial-and-error, I found the problem with Math Comment Spam Protection. Even better news: the fix is incredibly simple. Voila! The Math Comment Spam Protection plugin will now work again! This fix is so simple, I don't see any need to fork the code. I'll try to contact the developer, and see if he will patch the original. Do you use WordPress? Do you use several plugins? Have you ever considered donating to the authors of the plugins you use, but find it rather inconvenient to find each plugin's listing at WordPress.org Extend, just to find the author's Donate link? If so, then you will find the cbnet Manage Plugins Donate Link plugin to be incredibly useful. Plugin authors define their Donate link in the plugin's readme.txt file. This plugin reads each plugin's readme.txt to find the Donate link, and then, if it finds one, adds that link to the list of links in plugin_row_meta beneath the plugin description on the Manage Plugins page. With this plugin enabled, you will have quick, convenient, one-stop access to the Donate links for the authors of all your installed plugins. My hope is that this plugin will encourage more voluntary donations to plugin authors, most of whom put in countless hours of unpaid code contribution to the WordPress community. More and more plugin authors, out of economic necessity, are moving to "freemium", subscription, or other paid models, because they simply do not receive donations from those who use their plugins. This plugin is but a humble attempt to encourage more users to donate to plugin authors. Please do not post support questions here. Please post all support questions in the plugin support forum. When I first started blogging many years ago, I used the Blogger platform, which I imported to my own domain using FTP (so that anyone reading my blog would see it as www.chipbennett.net). At the time, Blogger's commenting system was rather rudimentary, so I opted to use a third-party comment management system called Haloscan. Interestingly, due to developments over the past couple of months, had I stuck with this arrangement, I would be in serious trouble. Recently, Haloscan was bought by Echo, which has announced that Haloscan is being discontinued in a matter of days. Likewise, Blogger has recently announced that it is discontinuing support for FTP importing of Blogger-hosted blogs to third-party domains. Fortunately, I long ago left Blogger for the infinitely better self-hosted WordPress. Thus, even though Blogger has implemented a replacement service - their Custom Domains feature - and therefore the change would be minor, I don't have to worry about it at all. More problematic, however, is the announced discontinuation of the Haloscan commenting system. When I first moved to WordPress, I continued to use Haloscan, which I had been using on Blogger. At some point, I decided to make the jump to native WordPress comments - but I still had several hundred comments hosted by Haloscan. At the time, I was unable to export those comments from Haloscan, as such exports required the purchase of a Haloscan Pro account. So, I modified my blog theme to account for the old Haloscan comments, and kept a hybrid system. Now, however, with the announced discontinuation of Haloscan, my hand was forced. Fortunately, Echo offered the option of converting to a (paid) Echo account, or exporting Haloscan comments. I quickly exported my comments, as I had no desire to pay for something that I was doing natively from within WordPress. Thus, the problem became one of how to import several hundred comments into my WordPress database? Fortunately, this script came to the rescue, with a slight modification provided by the script developer. Using the provided script and the export.xml file provided by the Haloscan export, I seamlessly pulled all of my several hundred Haloscan comments into my WordPress database. If you find yourself facing the same situation, the above script should help you as well. If you need to import Blogger-integrated Haloscan comments into your WordPress installation, follow the instructions provided by the script author, at the above link. Export your existing Haloscan comments by logging into your Haloscan account and following the instructions provided. Click the "OK" button to perform the import. If your experience is like mine, you may get an error regarding a malformed XML file, due to its encoding. There are various options for rectifying the problem, but in my case, I just went to the line in export.xml indicated by the error message, and replaced the non-UTF-8 characters (in my case, fancy quote marks) with valid characters, and re-ran the script. Everything worked flawlessly at that point. Your plugin must be GPL Compatible. The plugin most not do anything illegal, or be morally offensive (that’s subjective, we know). You have to actually use the subversion repository we give you in order for your plugin to show up on this site. The WordPress Plugins Directory is a hosting site, not a listing site. (13:27:03) KnxDT: By the way: Is the GPL header necesary? Based on these findings, I decided to audit a few well-known and influential plugin authors - not to pick on the more high-profile developers per se, but rather to determine the state of license inclusion in plugins developed by those who, ideally, should be leading by example. bbPress: License File: YES. Plugin Header License Notice: NO. HyperDB: License File: NO. Plugin Header License Notice: NO. Akismet: License File: NO. Plugin Header License Notice: NO. Close Old Posts: License File: NO. Plugin Header License Notice: NO. SyntaxHighlighter Plus: License File: YES. Plugin Header License Notice: NO. Yahoo Autotag: License File: NO. Plugin Header License Notice: NO. Twitter Friends: License File: NO. Plugin Header License Notice: NO. Top Comments: License File: NO. Plugin Header License Notice: YES. Matt's Community Tags: License File: NO. Plugin Header License Notice: NO. Random Redirect: License File: NO. Plugin Header License Notice: NO. Hello Dolly: License File: NO. Plugin Header License Notice: NO. Sympathy For The Devil: License File: NO. Plugin Header License Notice: NO. Google AdSense for Feeds: License File: NO. Plugin Header License Notice: NO. Cache Images: License File: NO. Plugin Header License Notice: NO. Advanced Caching: License File: NO. Plugin Header License Notice: NO. fauxML: License File: NO. Plugin Header License Notice: NO. Admin IP Watcher: License File: NO. Plugin Header License Notice: NO. No WWW: License File: NO. Plugin Header License Notice: NO. Firefox Counter: License File: NO. Plugin Header License Notice: NO. WYSIWYG Editing: License File: NO. Plugin Header License Notice: NO. Staticize Reloaded: License File: NO. Plugin Header License Notice: NO. Blogtimes: License File: NO. Plugin Header License Notice: NO. Protect Old Posts: License File: NO. Plugin Header License Notice: NO. bbPress was originally a stand-alone script, that included a license.txt file. SyntaxHilighter Plus was written by Viper007Bond, but credited to Matt. Top Comments was written by Andrew Ozz. (0/19) of Matt Mullenweg's plugins written as a plugin and maintained by him have license notice of some kind. Shockingly, the majority of Matt's plugins lack even a readme.txt file. Quiz: License File: NO. Plugin Header License Notice: NO. I Make Plugins: License File: NO. Plugin Header License Notice: YES. Page Links To: License File: NO. Plugin Header License Notice: YES. Woopra Analytics Plugin: License File: YES. Plugin Header License Notice: YES. Bad Behavior: License File: NO. Plugin Header License Notice: YES. Category Checklist Expander: License File: NO. Plugin Header License Notice: YES. Gravatar Signup: License File: NO. Plugin Header License Notice: NO. Forget User Info: License File: NO. Plugin Header License Notice: NO. Antispam Collateral Condolences: License File: NO. Plugin Header License Notice: NO. WordPress Version Check: License File: NO. Plugin Header License Notice: YES. Comment Inbox: License File: NO. Plugin Header License Notice: NO. Age Verification: License File: NO. Plugin Header License Notice: YES. Subscribe to Comments: License File: NO. Plugin Header License Notice: NO. Subpage Listing: License File: NO. Plugin Header License Notice: YES. Redirect Old Slugs: License File: NO. Plugin Header License Notice: YES. Kramer: License File: NO. Plugin Header License Notice: YES. Clutter Free: License File: NO. Plugin Header License Notice: NO. Multiple Authors: License File: NO. Plugin Header License Notice: YES. Page Hover Titles: License File: NO. Plugin Header License Notice: NO. Identify External Links: License File: NO. Plugin Header License Notice: YES. Nice Categories: License File: NO. Plugin Header License Notice: YES. (13/21) of Mark Jaquith's plugins have license notice of some kind (including one with both a license.txt file and plugin header license notice). YOURLS: WordPress to Twitter: License File: NO. Plugin Header License Notice: NO. Ozh' Admin Drop Down Menu: License File: NO. Plugin Header License Notice: NO. Liz Comment Counter by Ozh: License File: NO. Plugin Header License Notice: NO. Ozh' Better Plugin Page: License File: NO. Plugin Header License Notice: NO. Ozh' Absolute Comments: License File: NO. Plugin Header License Notice: NO. Ozh' Better Feed: License File: NO. Plugin Header License Notice: NO. No Login: License File: NO. Plugin Header License Notice: NO. Ozh' Who Sees Ads: License File: NO. Plugin Header License Notice: NO. Ozh' Random Words: License File: NO. Plugin Header License Notice: NO. Ozh' FAQ Auto Responder: License File: NO. Plugin Header License Notice: NO. Ozh & COLOURlovers' Admin CSS Designer: License File: NO. Plugin Header License Notice: NO. Ozh' Click Counter: License File: NO. Plugin Header License Notice: NO. Ozh' Auto Moderate Comments: License File: NO. Plugin Header License Notice: NO. Ozh' IP To Nation: License File: NO. Plugin Header License Notice: NO. Ozh' Correctly Spell WordPress: License File: NO. Plugin Header License Notice: NO. Ozh' Avatar Popup: License File: NO. Plugin Header License Notice: NO. (0/16) of Ozh' plugins have license notice of some kind. wp smtp contact form: License File: YES. Plugin Header License Notice: YES. WordPress Beta tester: License File: NO. Plugin Header License Notice: NO. PJW JS Hotkeys: License File: NO. Plugin Header License Notice: YES. PJW Mime Config: License File: NO. Plugin Header License Notice: YES. WP Contact Form: License File: NO. Plugin Header License Notice: NO. PJW Blogminder: License File: NO. Plugin Header License Notice: NO. PJW Query Child Of: License File: NO. Plugin Header License Notice: NO. PJW Page Excerpt: License File: NO. Plugin Header License Notice: NO. (4/9) of Westi's plugins have license notice of some kind (including one with both a license.txt file and plugin header license notice). WordPress Admin Bar: License File: NO. Plugin Header License Notice: YES. SyntaxHighlighter Evolved: License File: YES. Plugin Header License Notice: NO. Enable oEmbed Discovery: License File: NO. Plugin Header License Notice: NO. jQuery Lightbox for Native Galleries: License File: NO. Plugin Header License Notice: NO. YOURLS: Short URL Widget: License File: NO. Plugin Header License Notice: NO. Local Time: License File: NO. Plugin Header License Notice: NO. Breadcrumb Titles for Pages: License File: NO. Plugin Header License Notice: YES. Viper's Video Quicktags: License File: NO. Plugin Header License Notice: YES. Regenerate Thumbnails: License File: NO. Plugin Header License Notice: YES. Clean Archives Reloaded: License File: NO. Plugin Header License Notice: YES. oohEmbed: License File: NO. Plugin Header License Notice: NO. Dashboard: Pending Review: License File: NO. Plugin Header License Notice: NO. Twitter Tools: bit.ly Links: License File: NO. Plugin Header License Notice: NO. WordPress Download Counter: License File: NO. Plugin Header License Notice: NO. WordPress.org One-Click Install: License File: NO. Plugin Header License Notice: NO. Registered Users Only: License File: NO. Plugin Header License Notice: NO. Phone: License File: NO. Plugin Header License Notice: NO. Dashboard: Scheduled Posts: License File: NO. Plugin Header License Notice: NO. Disable Trackbacks: License File: NO. Plugin Header License Notice: YES. Dashboard Widget Manager: License File: NO. Plugin Header License Notice: NO. Direct Image URLs for Galleries: License File: NO. Plugin Header License Notice: YES. Disable Theme Preview: License File: NO. Plugin Header License Notice: YES. More To The Top: License File: NO. Plugin Header License Notice: YES. Allow Numeric Stubs: License File: NO. Plugin Header License Notice: YES. Dashboard: Latest Spam: License File: NO. Plugin Header License Notice: NO. BBCode: License File: NO. Plugin Header License Notice: YES. Dashboard: Draft Posts: License File: NO. Plugin Header License Notice: NO. Chili Code Highlighter: License File: NO. Plugin Header License Notice: YES. Global Plugin Update Notice: License File: NO. Plugin Header License Notice: NO. Dashboard Fixer: License File: NO. Plugin Header License Notice: NO. Templatedia: License File: NO. Plugin Header License Notice: NO. Battlefield 2 Stats: License File: NO. Plugin Header License Notice: NO. Templatedia Chess: License File: NO. Plugin Header License Notice: NO. Viper's Plugins Used: License File: NO. Plugin Header License Notice: NO. (11/33) of Viper007Bond's plugins have license notice of some kind. Overall, for the plugin authors listed, only 28 out of 107 plugins (26%) have license notice of some kind (including two plugins that have both a license.txt file and a plugin header license notice). And the number is only that high thanks to Mark Jaquith, without whom the percentage of plugins with license notice of some kind would drop to less than 18%. Only 2 out of 107 plugins (<2%) include both a license.txt file and license information in the plugin header. I find these numbers to be downright shocking, considering the unwritten rule now being enforced regarding removal from the repository of plugins that lack license disclosure, as well as the assertion that plugins should "ideally" include a license.txt file. Let me be clear: I fully support the effort to ensure that plugin authors explicitly disclose license information in their plugins, either in the plugin header or in a separate license.txt file. The assertion that users need to be given explicit explanation of their rights to use, modify, and distribute plugins. That said, perhaps those in the WordPress project leadership, and the plugin developers whom others look up to, should ensure that they are leading by example before a more-strict interpretation of the Plugin Repository guidelines is enforced against plugin developers at large. This way, new plugin authors would have a standard means of disclosing license information in their plugin - and also, users searching Extend for new plugins would have a known means of determining the license of any given plugin. The So-Called WordPress "Ban Hammer"
The latest WordPress-related minor controversy involves the removal of MaxBlogPress plugins from the WordPress plugin repository. The action appears to be in response to numerous complaints and calls for their removal, due to the behavior of the plugins. The news of the removal of MBP plugins from the WordPress repository first appeared on the Warrior forum (h/t WPKid), and then on WPTavern, the WPTavern forum, and BloggingPro. The MBP plugins, which offer a range of functionality from basic blog management (Ping Optimizer, Different Posts Per Page, Multi Author Comment Notification, Duplicate Post Checker) to internet-marketing tools (Stripe Ad, Unblockable Popup, Optin Form Adder, SEO Post Link, etc. ), exhibit some abnormal behavior for WordPress repository-hosted plugins. Upon installation of the plugin, a notification message is displayed on the Plugin Management page, indicating that the plugin needs to be registered. The options page, instead of displaying plugin options, first displays a two-part registration form. The first form requires a name and email address. Upon submission of this form, the user receives an email list subscription confirmation email. The user is required to click the link in the email to confirm their subscription. Until the user does so, the plugin options page displays only a message that the email must be responded to. Once the user clicks the link in the email, confirming the double-opt-in of the email list subscription, returning to the options page will, before displaying the plugin options, perform an update check - not through the WordPress SVN that hosts the plugin, but from the MaxBlogPress web site. If an update is available, the plugin updates itself. Only then does the options page (finally) display the plugin options, and enable use of the plugin. Not all MBP plugins hosted at the WordPress repository were released under the GPL (or a compatibile license). Some MBP plugins embed external (i.e. public-facing) "powered by MaxBlogPress" links on users' blogs. Many users complained that the email list to which they were forced to subscribe behaved in a "spammy" manner, sending far too many emails (daily or near-daily) with content that only marginally (if at all) had anything to do with the plugin they installed. If you unsubscribe from the email list, existing MBP plugins will continue to work, but if you install any new MBP plugins, you will have to re-register, including re-subscribing to the email list from which you already unsubscribed. This behavior violates the GPL under which the plugins were released. This behavior uses WordPress repository SVN merely for listing, rather than for hosting. This behavior violates the guideline against embedding external "powered by" links. The freedom to run the program means the freedom for any kind of person or organization to use it on any kind of computer system, for any kind of overall job and purpose, without being required to communicate about it with the developer or any other specific entity. In this freedom, it is the user's purpose that matters, not the developer's purpose; you as a user are free to run the program for your purposes, and if you distribute it to someone else, she is then free to run it for her purposes, but you are not entitled to impose your purposes on her. Requiring "registration" or "activation" in order to use an MBP plugin is clearly a violation of this principle. Requiring email-list subscription (forced opt-in) in order to use an MBP plugin is clearly a violation of this principle. So, compelling the user to register/"activate" software is a violation of the GPL - much less, requiring the user to opt-in to an email list. Such functionality clearly violates the user's freedom of use of the software without being required to communicate about it with the developer or any other specific entity. Thus, as written and distributed by MBP, the plugins in question do not conform to the GPL, which by its own definition is a free software license. Further, some of the MBP plugins hosted by the WordPress repository were released under licenses that are not compatible with the GPL. By using the software, you agree to be bound by the terms of this license. 1. You may install and use the software on as many computers and websites/blogs as you wish. You may make back-up copies of the software for archival purposes. 2. You can distribute this software in its original form with any other products or stand alone. 3. You are not allowed to use this script library for creating any other software or plugin without expressed permission from us. 4. The software is protected by the copyright laws of the U.S. and other countries, and we retain all intellectual property rights in the software. You may not separately publish, sell, market, distribute, lend, lease, rent, modify, reverse engineer or sublicense the software code. 5. You must not make any modification to the software without express permission from us. If there is a feature you want included or a bug you want fixed, let us know. Such a license is clearly incompatible with the GPL, and any plugin released under such a license should never be allowed in the WordPress repository. The plugin then uses this version check to determine if an update is available, downloads the update, and installs it - entirely circumventing the WordPress repository. All MBP plugins have this same functionality. Thus, essentially, the plugins are using the WordPress repository merely as a listing site - a means to allow users to search for their plugins (or tags/keywords for their plugins) in order to get more exposure and more users installing their plugins. Such exposure is intended to be a benefit of hosting a plugin on the WordPress repository, not the sole purpose - which is why the guidelines explicitly state that the repository is for hosting, not merely for listing. No it’s NOT licensed under GNU GPL. We are using that format of readme.txt as most people are familiar with that. It’s illegal to remove the powered by link without notifying me about that. While the response from WordPress was the removal of the MBP plugins from the WordPress repository, I decided to respond on my own. When the news broke, several people suggested that the plugins should be forked, to remove the offending code. I thought that this suggestion would make for a good challenge, so I undertook it. As it turns out, removing the offending code from the plugins proved to be incredibly easy. Thus, forks of Favicon, Ping Optimizer, Multi Author Comment Notification, and Different Posts Per Page are now available from the WordPress repository. Further, as pointed out by Blogging Pro (linked above), making the MBP plugins think that they are activated is as easy as updating a single database option for each plugin. It seemed like it would be fairly easy to loop through each plugin's option, and set it to the appropriate value, and I thought that some enterprising plugin author should whip up a plugin to do so. As it turns out, I ended up being that plugin author (with a great deal of help from my friends at the WPTavern forum). As a result, I have also released cbnet MBP Auto-Activate, which, when installed, will determine which MBP plugins are installed, and automatically activate them, without needing to register or subscribe to the email list. The plugin will auto-activate any MBP plugins subsequently installed, also. If you use MBP plugins, please let me know if you find any of these plugins to be useful. And if I can improve them, please let me know that, as well.